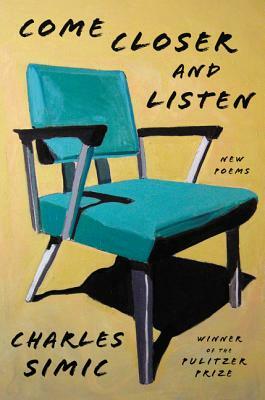 Irreverent and sly, observant and keenly imagined, Come Closer and Listen is the latest work from one of our most beloved poets. With his trademark sense of humor, open-hearted empathy, and perceptive vision, Charles Simic roots his poetry in the ordinary world while still taking in the wide sweep of the human experience. From poems pithy, wry, and cutting—“Time—that murderer/that no has caught yet”—to his layered reflections on everything from love to grief to the wonders of nature, from the story of St. Sebastian to that of a couple weeding side by side, Simic’s work continues to reveal to us an unmistakable voice in modern poetry. An innovator in form and a chronicler of both our interior lives and the people we are in the world, Simic remains one of our most important and lasting voices on the page. Charles Simic, poet, essayist, and translator, was born in Yugoslavia in 1938 and immigrated to the United States in 1954. Since 1967, he has published twenty books of his own poetry, in addition to a memoir; the essay collection The Life of Images; and numerous books of translations for which he has received many literary awards, including the Pulitzer Prize, the Griffin Prize, the MacArthur Fellowship, and the Wallace Stevens Award. Simic is a frequent contributor to The New York Review of Books and in 2007 was chosen as poet laureate of the United States. He is emeritus professor at the University of New Hampshire, where he has taught since 1973, and is distinguished visiting writer at New York University.